The Denver chapter no longer accepts blankets for court ordered community service or polar fleece blankets that have not had BOTH selvedge edges removed. Parker, Colorado is the birthplace of Project Linus. Our founding chapter celebrated its 23rd anniversary Christmas Eve! Since its early days, the Denver chapter has made and delivered tens of thousands of blankets to seriously ill and traumatized children locally and worldwide. Nationally, the organization has delivered over 7,138,349 million handmade security blankets. That’s more than the populations of Denmark, Finland, Norway or Ireland! In the Denver metro area, most of our blankets go to Denver Health and The Children’s Hospital as they have the highest populations of pediatric patients. We also regularly deliver to other local hospitals, hospice, police & fire departments, social services, specialty camps, military, Indian reservations, etc. We sometimes share our blankets with the 370ish chapters around the country when a special need arises (hurricanes, floods, tornado, shooting, etc.) We work with a variety of organizations and individuals who help disperse blankets to children around the globe. Project Linus has become an integral part of the military by helping when a parent is deployed, helping knit a family back together after deployment and delivering blankets to children of fallen soldiers. Please do not deliver directly to the recipient sites if you want your blanket to be considered a Project Linus blanket. We need to inspect each donation for potential hazards. We add our signature Linus tag onto each blanket that has passed inspection before delivery. Littleton– Unity Church of Littleton, 7950 S. Lincoln St #106, Littleton, 80122. Please call ahead at (303) 798-2295 to arrange a drop off time. We are looking for more blanket drop offs in sites around town. Businesses make an ideal drop off location as they tend to be a more convenient for our blanket makers (blanketeers!) and bring potential customers through your doors. Please contact the number listed below if you have suggestions. Thanks! All chapters are run by volunteers. The Denver chapter is eager to have participation from the community. Knitters, Crocheters, Quilters and Polar Fleece Tie-ers are lovingly referred to as our Blanketeers. They come in all shapes, ages and sizes. If you are a member of a group -schools, scout troop, church, 4H, civic clubs, MOPS, book club, guild, family night, etc.- who would like to have a fun, team building activity, making Project Linus blankets can be the answer! The Denver area is blessed with prolific blanketeers and we sometimes find ourselves overwhelmed with the task of labeling the blankets we receive. It’s a simple as hand or machine sewing a shirt-tag sized label to blankets that have passed our quality check. If you or your group would like to assist us with this endeavor, we would be thrilled! There are many other volunteer activities available if blanket making is not your cup of tea. Some suggestions include Fundraising, Labeling, Delivering, Public Relations, Event Assistance, Web Design, etc. but we are also open to your suggestions and skills. And as always, tax deductible monetary donations are always very helpful. Adding Project Linus Denver to your will is a great way to continue your giving spirit. Happy to answer any questions you may have about this. WE ARE NO LONGER ACCEPTING POLAR FLEECE BLANKETS THAT HAVE EITHER OF THEIR SALVAGE EDGES ON THEM- Please see the illustrations below or call if you have questions. As volunteers, we do not have time to fix poorly made blankets. They WILL NOT be donated to the children we serve and will not count as service hours. Blankets must be handmade and unused (please, no store-bought). We cannot accept blankets that smell smokey. Some of our recipient children are immune compromised, allergic or very sensitive to the carcinogens . It is extremely difficult to remove tar and nicotine from fibers. A simple wash through a washing machine is not adequate and masking it with a Fabreeze type product or perfumey fabric softener can exacerbate the situation. If you have pets (and many of us do), please keep them away from the blankets. Some children are allergic to animals and perfumes, so it is imperative that we avoid these irritants. Any size is acceptable. We deliver blankets to children ranging from neonatal to young adult. The best size that fits a wide variety of children is approximately 40″ x 60″. 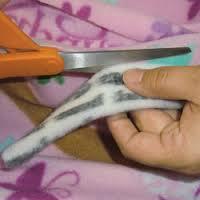 When buying polar fleece fabric, please make sure it is NON PILLING. Otherwise, the fabric will start shredding as soon as a cut is made. 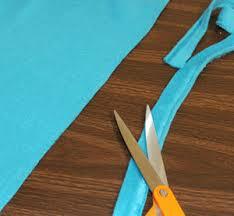 If you’re making polar fleece blankets, please trim off BOTH selvage edges before cutting the fringe. We no longer accept blankets that have not had their selvage edges removed. They take too much of our volunteer time to fix what could have easily been done properly at the beginning of the project. The selvage is the two side edges that curl up, have pin holes, and test patterns. It only takes a few seconds, and makes for a much more attractive blanket. It takes too much time for our volunteers to fix poorly made blankets. Please do not fringe or put dangling embellishments on blankets intended for babies or young children as they may present a choking hazard. All child and young adult patterns are welcome. We are often asked if we have a special needs and that would be boy themed blankets. The vast majority that we receive tend to be traditional female friendly colors and designs- yet we serve just as many boys as we do girls. Project Linus is a 501(c)(3) non-profit organization. Monetary donations are tax deductible. Donation receipts are available for blankets and Items in Kind donations. Blanketeers should keep store receipts when buying supplies, because that is what the IRS uses to value the items, vs. what the value of the finished blanket might be. Please contact your tax preparer for specific questions. Each coordinator is responsible for fundraising to support their individual chapter. If a check is sent to our national headquarters, it will be placed in a general fund unless it is specifically earmarked such as for “Denver Chapter.” Checks should be made to “Project Linus” and sent to Project Linus Denver Chapter, 20450 Oakbrook Lane, Parker, CO 80138. You can also go onto the national web site www.projectlinus.org and specifically request that your donation is used for the Denver chapter. Founder and Denver Coordinator Karen Loucks Rinedollar is a professional speaker and receives an honorarium for sharing her expertise. She is the author of the award winning book Working for Peanuts: The Project Linus Story and is frequently requested to give motivational Keynotes to healthcare, social services, schools, associations and corporations across the country as well as delivering graduation/commencement addresses. 2017 Denver Metro appearances are $2,500 / $1000 for sanctioned nonprofits. Other locations are quoted per event.